In situations like these, don’t bother with the Maltese press that is sitting about waiting for press releases from Kurt Farrugia. Go straight to the portals with Azerbaijani (or Chinese, as the case may be) news. Azerbaijan and Malta signed two documents on strategic cooperation in the oil and gas sector, the Azerbaijani Cabinet of Ministers said Dec. 15. The documents were signed as part of a delegation headed by Prime Minister of Malta Joseph Muscat’s visit to Azerbaijan. A memorandum of understanding on strategic cooperation in the oil and gas sector between SOCAR (State Oil Company of Azerbaijan) and the Ministry of Energy and Health of Malta was signed by SOCAR president Rovnag Abdullayev and Minister of Energy and Health of Malta Konrad Mizzi. A memorandum of understanding on strategic cooperation in the oil and gas sector between the Ministry of Energy of Azerbaijan and the Ministry of Energy and Health of Malta was signed by Energy Minister of Azerbaijan Natig Aliyev and Minister of Energy and Health of Malta Konrad Mizzi. During a meeting with Maltese counterpart, Azerbaijani Prime Minister Artur Rasizade stressed the importance of Joseph Muscat’s visit to Baku in terms of creating a legal framework for expanding the cooperation between the two countries. Muscat said that Azerbaijan is turning into an important trade partner for Malta. The documents, signed between the two countries, create good conditions for expanding the cooperation. One can now truly say that Konrat Mizzi’s milestone schedule is going backwards rather than forward. From an alleged contract signed with Electrogas, we are now back to an “MOU on strategic cooperation in the oil and gas sector” with SOCAR. This is getting really and truly messy. Electrogas is out, Ciccio, kaput. “More MOUs signed by MOUscat government. A memorandum of understanding is absolutely worthless. Anyone can collect a list of non-enforceable non-binding letters wherein two parties agree to cooperate in principle. There is no skill involved. The skill is in convincing the parties involved into implementing the letter into an actual project with tangible benefits for the country. This is also known as the “hell is paved with good intentions” phenomenon. “Muscat said that Azerbaijan is turning into an important trade partner for Malta.” Now this is ambiguous and scary at the same time. Why Muscat is attempting to sour Malta’s relations with the EU and the US in favour of pacts with the creme de la creme of amoral dictatorships is beyond me? The more I observe of Muscat’s true roadmap unfolding, the prouder I am of having voted for the Nationalists. Muscat’s a puppet. You think he dreams these trips up on his own? Someone is pocketing a selection of brown bags somewhere. You should see the pretty consulate, right off St.Christopher Street, just up the steps from lower Barakka. One’s led to think Azerbaijan is some Swiss Canton, flowers and crochet screens at the windows. Anyone for a picket line? Something’s wrong with one of these MOUs. A cabinet minister signs on behalf of his country while the chairman of a company signs on behalf of his…. company. A country does not sign with a company. Or maybe it does now under the logic of Shiv Nair, Joe Muscat and Konrad Mizzi. Daphne, way ahead of them all while miskina Miriam ta’ Malta Today tistenna naqra inside information minghand Kurt ta’ Joseph. Dik qed tistenna l-cookies ta’ Kurt, imma ha jdumu ftit ma jaslu mill-Azerbaijan. I would like to ask, how many times has our Prime Minister met European Union leaders? And why does Joseph Muscat feel more comfortable with dictators? SHAME ON YOU JOSEPH MUSCAT. Wasn’t Electrogas meant to supply gas for its power station and supply gas to power the Delimara converted power station too? In my opinion it was always Socar’s gas they were after, and this when the pipeline through Turkey by Greece and ending up at South of Italy is ready. This will not be ready by June 2015 or 2016 but is scheduled to be finished in 2018, as announced by Socar in October 2013 and in line with my guesswork announced in September 2013. It’s also my guess that they want to supply the EU with this gas. There was no way they could have won an election based on this Foreign Policy. So the Power Station scenarios and roadmaps etc. etc. was illusioned into being. And of course the Nationalists vilified for their vision in preparing the interconnector. The Energy Minister Aliyev is family. Shiv Nair is an advisor. Shiv Nair is barred by the World Bank. The Aliyevs’ business isn’t welcome everywhere. Joseph Muscat is chief stooge. The exact political model used for this specific lateral approach by MLP was George Bush Junior’s lie in feigning to know nothing about Foreign Policy prior to his first election. The sensitive point there was that the voters did not want a continuation or repeat of the wars that had characterised his father’s administration. Does that sound familiar? People thought: If he doesn’t even know who the Foreign Affairs Minister is for Canada then we are safe in letting him in, he won’t be interested in the Middle East – which in their perception then was still a planet away. This was a strategy recognised, identified, named, DISCUSSED by the Shiv Nair crowd, traded and implemented. It held a high positive value promising maximum impact, to them. Once you identify the value being considered, the polarity and weighting given, informed guesswork follows a natural course. If additionally you know, from direct personal experience, that the MLP can never be trusted to be truthful, every warning sensor is on high alert. The essential thing to retain is that the MLP were voted in on a series of lies. This lie was told with the full intention of deceiving the electorate. The MLP was voted in on a scam and is holding a false mandate. The Malta Labour Party should not be in the governing seat. Is Shell no longer involved? I am starting to believe that they never had any commitment with Shell. I suspect that when they realised the everyone else had noticed that Electrogas is not taking off, they probably started some form of informal, emergency discussions with Shell, and sought to reassure public opinion that way. How else can one explain it? Azerbaijan is a significant transit country for heroin and other narcotics, as it is situated along major drug trafficking routes from Afghanistan and Iran to Europe and Russia. So Malta is a perfect partner: Malta is a significant transit country for weapons and guns. Azerbaijan is also on China’s Economic Silk Road. Please do not underestimate this fact. 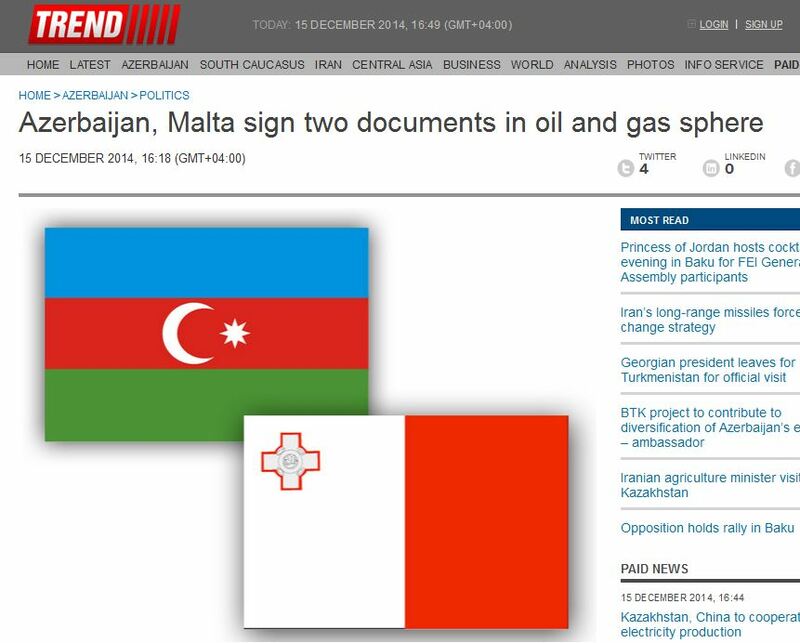 It’s 3pm and the Maltese online news portals are not reporting the signing of these agreements yet. Il-Ministru għal-Enerġija u s-Saħħa Konrad Mizzi u c-Chief of Staff fl-Uffiċċju tal-Prim Ministru Keith Schembri akkumpanjaw lill-Prim Ministru. Journalists should be asking if Keith met his disappeared cousin Ryan Schembri in Azerbaijan, and if Ryan is undergoing a skills update. And what is Kurt doing in the second photo? Still trying to find the roadmap whilst his master Joseph Muscat is discussing with the Azeri dictator? Deconstructing indicators. Kurt is their sensor. He will always have two major drawbacks, however. 15.33 and Times of Malta catch on and announce the signing. I deeply miss a symbol for sarcasm sometimes. Sorry, I was talking about Times of Malta and Department of Information oblivion in my previous post. I didn’t doubt what you said. I think Muscat’s element of SURPRISE!!! is being doused with cold showers of water, first by Ivan Camilleri of The Sunday Times of Malta and now by Daphne here. Muscat likes to use the element of surprise against his opponents as anyone can observe. Now he has to think of plan B for the Enemalta/Shanghai Electric agreement debate in parliament. Muscat may be after the gas and oil, they’re after something else, and it’s not in our national interest. What legal framework is required to expand which kind of cooperation? Even because any fossil fuel agreement by an individual EU member state may well be subject to the strategic south line, currently blocked by Azerbaijan. It’s not clear on whose side the Chinese were up to a few months ago, Azeri interests contrasting those of Putin, Ukraine the consequence. Now that China committed to build its gas infrastructure using Ansaldo technology, Italy and Germany have the upper hand, what they don’t need is Muscat doing a double deal with Azerbaijan. Which is why the Chinese cannot be let anywhere near that interconnector. And don’t give me it’s a different company, they aren’t. So where is Konrat Mizzi’s wife? Has she disappeared, whilst still being handed that fat wage packet. She might have to be re-assigned to Baku.